Soft-spoken and reserved, Adante Leyesa may have found expression for an extroverted alter-ego through his eponymous fashion brand. It started as a hobby, making jewelry for friends and relatives while working as an accountant. Winning a design competition brought new found fame with fashion industry stylists and editors falling for his unabashed expression of the maximal style. Adante then decided to develop his brand - which he later expanded to include bags - for the local market before setting his sights on export. “Maraming challenges sa export,” he said, “katulad ng processing and documentation.” Adante also learned that designing for the foreign buyers is an entirely different ball game. He recalled how one particular style proved popular in Europe but didn’t get any orders from the Middle East. “Kailangan din ng cultural understanding,” Adante explained. 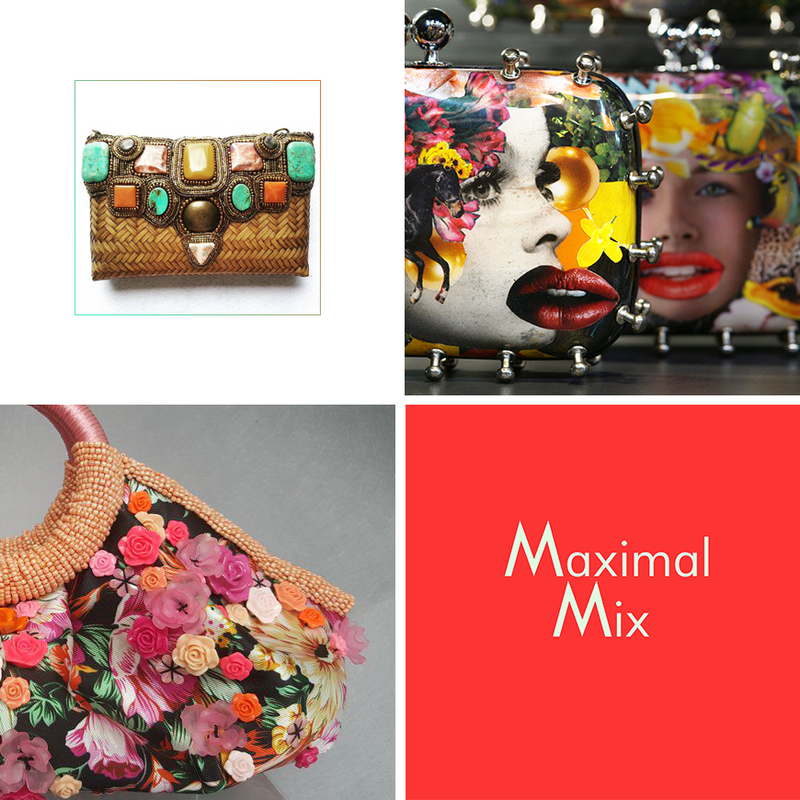 Top left : The native clutch gets a revamp. Top right : Clutches from the new Hyperbole series. Above Left : A handbag with woven trims and flowerettes. His style isn’t for the frail-hearted. A survey of Adante’s necklaces and bags reveals the artist-designer's fearless aesthetic marked by colors, patterns, textures and materials colliding in every piece. Delicate filigree cameo frames by Bulacan jewelers, carved mother of pearl pendants, resin orbs, as well as swatches of indigenous fabrics, to name a few, dangle from his neckpieces, while local embroidery, weavings, shells, etc. decorate Adante’s bags and clutches. “My foreign buyers appreciate the artisanal imprint, which is our edge over mass-produced items,” Adante said with pride. Adante nods to Filipino colonial style in a necklace of silver-dipped brass filigree pendants, fine embroidered fabric, pearl accents. For Manila FAME’s 68th edition, Adante showed a new line of bags and bib necklaces called Hyperbole. Adante layered his minaudieres with fashion images culled from old magazines. The collages were laminated before Adante added the final touch – a line of rivets tracing the bags’ silhouettes. The collection is testament to Adante’s remarkable talent for pulling from various motifs	to create designs in his signature maximalist style. 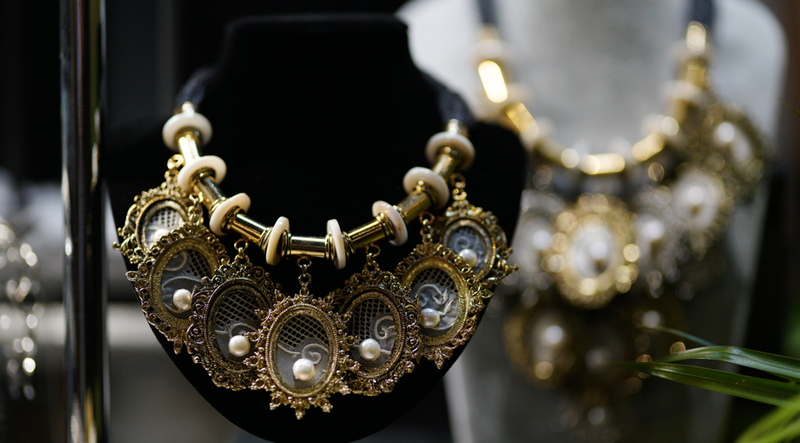 Top photo: A variation of a Filipiniana-themed pendant necklace made from local weavings, silver-dipped brass cameo pendants, and Philippine pearls.